No, you're not dreaming, this starter kit from Geek Vape really is just as amazing as it sounds. Whenever you use it you are going to be taken back by the epic clouds that you end up exhaling out into the universe and become mystified by its final result. Bringing together the Lucid Mod with the Lumi Tank you will be getting a seamless running operation that is able to make sure that you get those flavors that you love in the most accurately represented and fresh tasting form. Geek Vape makes products that are unlike anything else out there, they are always up on the latest and greatest trends and come up with some really innovative ideas. The Lucid 80W Starter Kit With Lumi Tank has an 80W power output, 4ml juice capacity and USB charging. 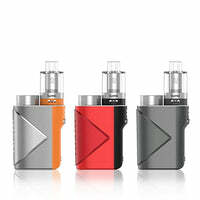 Lucid 80W Starter Kit With Lumi Tank - Geek Vape has a rating of 5.0 stars based on 1 reviews.